Vatican shuts down fountains as drought hits Rome. The office governing Vatican City State announced that the drought has “led the Holy See to take measures aimed at saving water” by shutting down fountains in St. Peter’s Square, throughout the Vatican Gardens and in the territory of the state. “The decision is in line with the teachings of Pope Francis, who reminds us in his encyclical ‘Laudato Si” how ‘the habit of wasting and discarding’ has reached ‘unprecedented levels’ while ‘fresh drinking water is an issue of primary importance, since it is indispensable for human life and for supporting terrestrial and aquatic ecosystems,’” the office said. The prolonged drought has forced officials from the Lazio region of Italy to halt pumping water from Lake Bracciano, located roughly 19 miles north of Rome. Lower-than-usual rainfalls in the past two years have steadily depleted the lake, which provides eight per cent of the city’s water supply. 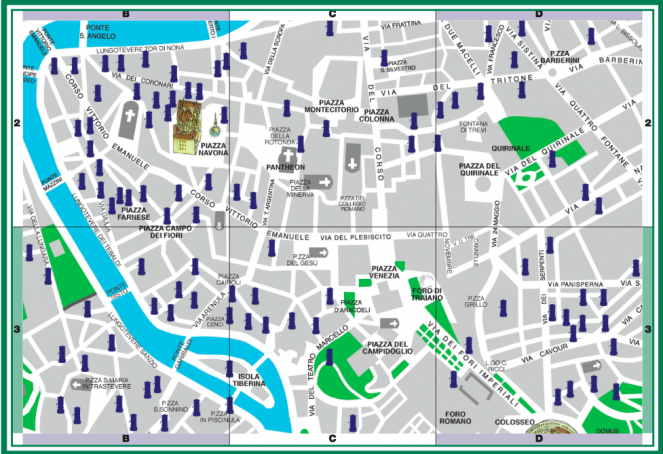 Here’s a helpful little map for tourists and pilgrims of the famous Roman water fountains – know as ‘Nasoni’ or ‘big noses’- where one can can sample some refreshment Roman style!!! Angelus: As the sower Jesus performs a spiritual radiography of our heart. During his Angelus address on Sunday to the pilgrims and tourists who braved the heat in St Peter’s Square, Pope Francis recalled the Gospel reading of the day, the famous parable of the sower. The Pope explained that the sower is Jesus, but the parable itself, the Pope went on to say concerns us, as it speaks of the soil and not the sower. The Holy Father continued, then “there is the thorny ground, full of rocks that suffocate the good plants.” This form of soil, he said, was the world seduced by wealth and greed, adding that the rocks were the vices that inhabit a person’s heart. With the Lord’s help, underlined Pope Francis, we can reclaim the land in the form of confession and prayer that removes the stones and thorns and purifies our hearts. During his address the Holy Father remembered the Blessed Virgin of Mount Carmel, who is celebrated on July 16th. Pope Francis creates new category for beatification: oblatio vitae. Pope Francis issued an Apostolic Letter motu proprio on Tuesday, by which he created a new category, distinct from martyrdom, under which a Servant of God may be declared Blessed: oblatio vitae, or “the free offering (i.e. “oblation”) of [one’s] life”. The Letter, Maiorem hac dilectionem, takes its title from the words of Our Lord as recorded in the Holy Gospel according to St. John, “Greater love than this no man hath, that a man lay down his life for his friends, (Jn 15:13)”. e) The necessity, for beatification, of a miracle, one that occurred after the death of the Servant of God, and by said Servant’s intercession. The oblatio vitae of the Servant of God, in order that it be valid and efficacious for beatification, must respond to all of the aforementioned criteria. Parco Savello, better known as the Giardino degli Aranci, was once a monastic orchard containing an orange grove within its enclosed walls. 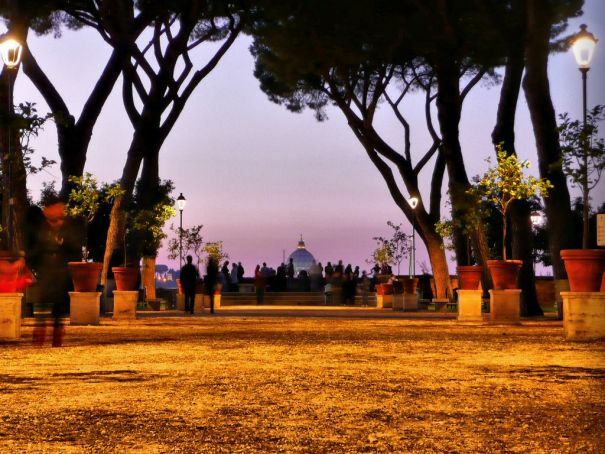 The orange trees can still be found in this romantic park which provides stunning views of the city across the river Tiber below. The garden was recently restored along with the adjoining Clivo di Rocca Savello, a walkway linking the park with the Lungotevere below. Open daily Oct-Feb 07.00-18.00, March 07.00-20.00, April-Aug 07.00-21.00, Sept 07.00-20.00. 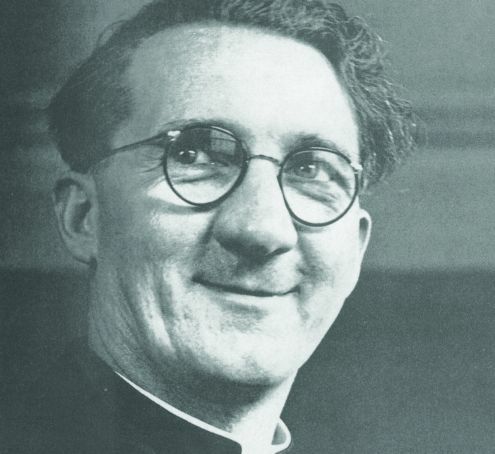 Monsignor Hugh O’Flaherty saved the lives of over 6,000 escapees in Rome during world war two. On 8 May a plaque was unveiled at the Vatican’s Collegium Teutonicum to honour the Irish priest Monsignor Hugh O’ Flaherty (1898-1964) for his work in rescuing Allied soldiers and Jews during world war two. After it was blessed by the rector of the college, two laurel wreaths were placed at the foot of the plaque on behalf of the Irish and British embassies to the Holy See. Ordained to the priesthood in 1925, following his studies in Rome, O’Flaherty was involved in a number of diplomatic postings in the early 1930s. In 1939 he was appointed to the Holy office, now the Congregation for the Doctrine of the Faith, and spent the next 20 years living at the Collegium Teutonicum. On Italy’s entry into world war two in 1941, O’Flaherty accompanied the papal nuncio to Italy in visiting prisoner of war (POW) camps in the north of Italy where thousands of Allied prisoners were confined. Unimpressed with the nuncio’s leisurely approach to his mission, O’Flaherty became much more involved. Travelling back to Rome from the north of Italy every night, he had the names of prisoners broadcast over Vatican Radio to reassure their loved ones at home. No respecter of red tape, he did not endear himself to the Italian military authorities and was responsible for the removal of two commandants at Piacenza and Modena, over their poor treatment of prisoners. Eventually complaints were made to the Vatican about this meddlesome priest, and O’Flaherty had to step down from his position and return to his office job in the Holy Office. The Allied invasion of north Africa in 1942 meant this time there were Italian POWs to be traced and helped, with their families seeking help from the Vatican. This invaluable experience in helping POWs was to stand O’Flaherty in good stead. In July 1943 the Allies landed in Italy and the war started coming closer to Rome. The Fascists increased their searches in the capital for prominent Jews and well-known anti-Fascists in the aristocracy. Whenever some of these needed to go into hiding, he would direct them to reliable friends or to convents and monasteries. But this proved insufficient. 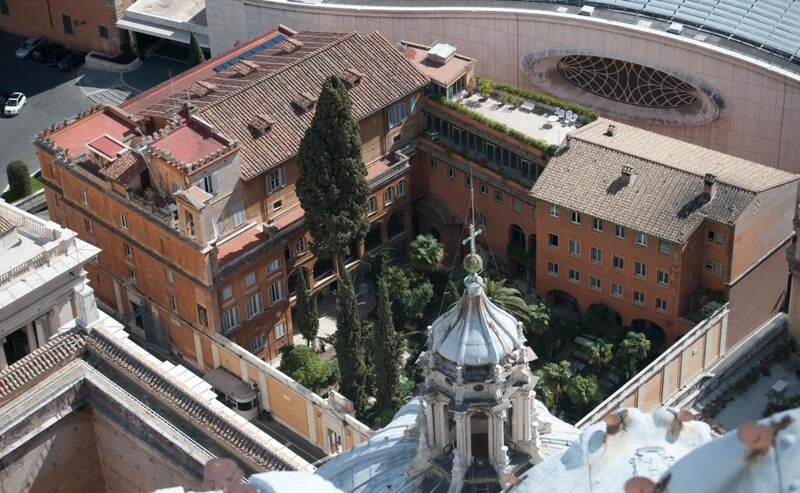 The Irish monsignor hit on using his own residence, the Collegium Teutonicum (pictured below), which had Vatican immunity. One of his first guests was Princess Ninì Pallavicini whose palace was raided when an illegal radio she had was tracked down by the Fascists. O’Flaherty found her accommodation in the nun’s quarters in the Collegium Teutonicum where she proved an invaluable assistance because of her skills in forging top-class identity documents. In July 1943 there were 74,000 known British POWs in Italy. Escapees tended to make their way to Rome and after the Italian surrender on 8 September, the trickle turned into a flood. Money, food and premises needed to be found urgently and it became much more dangerous after the German occupation of Rome on 11 September. O’Flaherty pointed out the gravity of the situation to Sir D’Arcy Osborne, British minister to the Holy See, resident inside the Vatican Walls at Casa S. Marta, where Pope Francis now lives, since the beginning of the war. Initially non-committal, Osborne replied that he could not compromise his own position nor the neutrality of the Vatican. But the monsignor insisted, saying that men would get sick and die in the mountains. Osborne relented, promising help from his own personal funds, and suggested that O’Flaherty talk to his butler John May. He added that he did not want to know any details so as not to compromise diplomatic relations with the Holy See. May recruited Count Sarsfield Salazar from the Swiss legation to set up the Council of Three which later became the Council of Four when British Major Sam Derry escaped to Rome. May was insistent that the team helping escapers needed a permanent organisation, that the operation was far too big for one man on his own. It was thus that the Rome Escape Line came into being. Another valued accomplice was Delia Murphy, wife of the Irish minister to the Vatican. She often used the legation’s diplomatic-registered car to transport escaping prisoners through enemy checkpoints, well aware of the implications for Irish neutrality had she been caught. Her beautiful 19-year-old daughter Blánaid chatted up German officials at embassy receptions and often gained useful nuggets of information to pass on to O’Flaherty. As the escape network developed, O’Flaherty’s activities came to the attention of the occupying German authorities. Herbert Kappler, head of the Gestapo in Rome, began specifically to target the monsignor, who had some hair-raising escapes. One of the most dramatic of these occurred when he was visiting Prince Doria Pamphilj at his palace on Via del Corso. A resolute anti-Fascist, the prince, who was married to a Scot, was a supporter of O’Flaherty and helped to finance his activities. When the Germans discovered O’Flaherty’s whereabouts they surrounded the palace. The game was up, or so it seemed. O’Flaherty went down into the basement and as luck would have it, the winter’s supply of coal was being delivered through a chute into the basement. Taking off his clerical robes and covering himself in soot, O’Flaherty whispered to one of the coalmen explaining his predicament. Some minutes later he walked out past the SS troops, black as the ace of spades, the soldiers making way so as not to be contaminated by him. O’Flaherty made for the nearest church, washed, changed his clothes and returned to the Collegium Teutonicum. Kappler made at least three other unsuccessful attempts to capture O’Flaherty outside Vatican territory where his diplomatic immunity did not apply. One of these entailed hustling him across the white line separating Vatican territory from the Italian state, letting him go and having him shot when attempting to escape. Fortunately May was tipped off in advance. While the two Gestapo agents pretended to be piously attending Mass in St Peter’s, May got four Swiss guards to remove them from the basilica. Instead of escorting them across the white line, however, the guards led them into a side street still in Vatican territory. Here they were left to the tender mercies of a group of tough Yugoslav partisans on May’s instructions. Given his lucky escapes, it is little wonder that Monsignor O’Flaherty was known as the Scarlet Pimpernel of the Vatican. While meticulous records were kept of the POWs being helped through O’Flaherty’s escape line, details of names and payments being buried each night in tin boxes in the Vatican Gardens, no such records were kept of Jewish escapees. However anecdotes survive. In one poignant case a Jewish man had approached O’Flaherty with his young son saying that he and his wife cared nothing for themselves, but could he save the boy? He gave O’Flaherty his gold watch to pay for his support. O’Flaherty took the boy, but also arranged to get his parents to safety. After the war the boy was reunited with his family, carrying his father’s watch. A s soon as the war was over O’Flaherty turned his attention to helping Italian and German prisoners of war. When questioned as to why he was now helping the former enemy, his simple response was: “God has no country.” Kappler was sentenced to life imprisonment for war crimes, particularly for his leading role in Rome’s Fosse Ardeatine massacre whose 335 victims included five of O’Flaherty’s helpers and one priest. Kappler’s only visitor for his first ten years in captivity, at the military prison in Gaeta south of Rome, was his former enemy number one, Hugh O’Flaherty, who eventually received him into the Catholic church and baptised him in 1959. The official records for the Rome Escape Organisation at the time of the liberation show that they were helping 3,925 escapees. We don’t know how many civilians and Jews should be added to that, possibly as many again. The plaque at the Collegium Teutonicum simply states that O’Flaherty saved over 6,000 people. How To Get A Papal Blessing For Your Marriage. Official Papal Blessings make an absolutely perfect wedding gift or as anniversary gift to your spouse. They can be received upon one’s wedding, or on the 10th, 25th, 40th, 50th, and 60th wedding anniversaries. The blessings come in the form of a beautifully ornate parchment with meticulous calligraphic text and image of the current pontiff on the top. – the address of where to send the parchment and payment details. 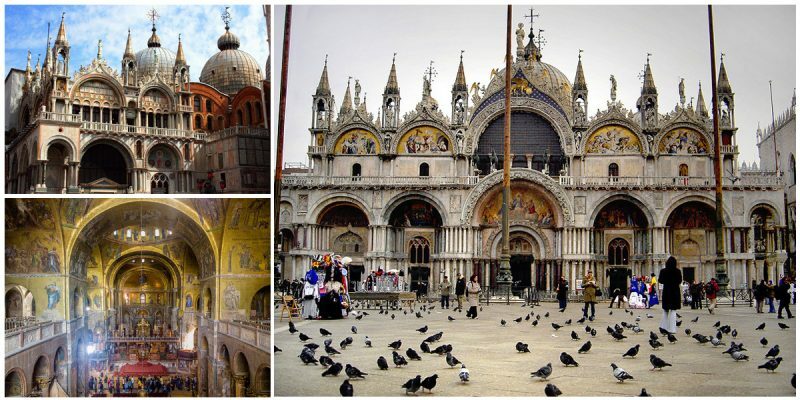 St. Mark’s Basilica, one of the most beautiful and most-visited buildings in Venice, is the cathedral church of the city’s Roman Catholic Archdiocese, and it is one of the most gorgeous examples anywhere of Italo-Byzantine architecture. The church is situated at the Piazza San Marco, adjacent to the Doge’s Palace. Originally, it was part of the palace, but since 1807 it has been the cathedral of Venice. Because of its magnificent design and its status as the city’s symbol for power and wealth, the cathedral has also been known as the “Church of Gold.” The most amazing part of its interior is the gold floor mosaics with their shimmering effect. The cathedral was built next to the Doge’s Palace in 828. In 976, it burned down but was rebuilt again in 978. Nothing definite is known about the previous design of these churches, and it is believed that today’s design was perhaps completed in 1063. 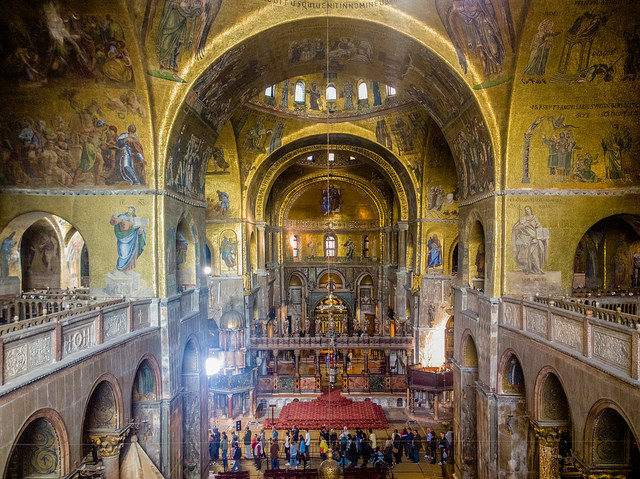 Many additions have been made since St. Mark’s became the seat of the Patriarch of Venice. The Pala d’Oro that was brought from Constantinople was installed inside in 1105, on the high altar. A year later, there was a fire, and the golden mosaics were severely damaged. Today, there are no original collections left because they are continuously restored; there is only some work from the 11th century that survived in the central porch. During the 13th century, most of the mosaics were finished, and the new façade and the narthex were completed. The basic construction was not changed much; only the decorations were redesigned over time. The latest additions to the building include St. Isidor’s Chapel at the beginning of the 14th century, the new carvings in the Sacristy in the 15th century, and in the 16th century the completion of the Zen Chapel.